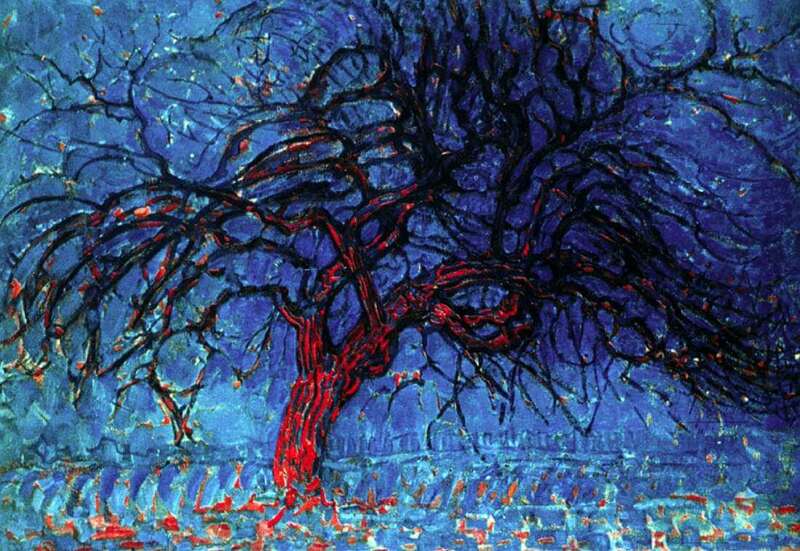 The Red Tree, one of the most important in Mondrian s series on the tree theme, was done in the same year as the Windmill in Sunlight. In its color range and brushwork, and above all in its conception of nature, it shows many points of contact with that other picture. Here too there seems to be a definite influence of Vincent van Gogh's paintings. The painting recalls certain of Vincent's pictures of trees, particularly olive trees and cypresses, in which the brushwork, along with the simplification of color, plays so important a part. But reference to these paintings is not by itself sufficient to explain the origin and character of the Red Tree. But this individual, personal style is not marked by the new acquisition of color alone. With respect to form, also, the Red Tree ranges far beyond the initial impression of nature. For comparison with the preliminary studies makes it evident that in the painting Mondrian has interpreted his impression of reality, transformed it into an idiom of his own: all the details of the tree's appearance, which in nature give a spatial effect, are straightened out on the pictorial surface, so that the linear structure of the brush strokes produces an almost completely flat impression. The spatial dimension of depth is suggested by the color, by the deep blue that Van Gogh identified with infinity. This use of color, this intense and spatially suggestive contrast of red (close by) and blue (receding), has a meaning that is not merely descriptive. In this painting Mondrian wanted to set down his entire vision of nature, his credo as regards the world: the calm prevailing over the entire picture, despite the violence of the tree's movement, is that of an equilibrium - the equilibrium which Mondrian wished to triumph over the tragedy of facts.